Nickname: SpaceGodzilla, AstroGodzilla, CrystalGodzilla, Kurisutarugojira, Asutorogojira, Supes, Sutar, and Suto. Height: 213 feet and 255 inches. he is also 280 feet and 21 inches long in his flying mode. He is also 8 feet tall in his human form. Skin/Fur/Scales, Etc. : Navy-blue skin and dark reddish purple scales. He has pale skin when in human form. Extra: (OPTIONAL, just in-case there's more you want to add. Like accessories or weapons) He carries an enchanted bow that when fully drew back, an arrow appears and can be fired. It never runs out of arrows. Hobbies/skills: Hunting, cooking, and flying. Weaknesses: SpaceGodzilla's shoulder crystals are not strong enough to withstand M.O.G.U.E.R.A's spiral grenade missiles. 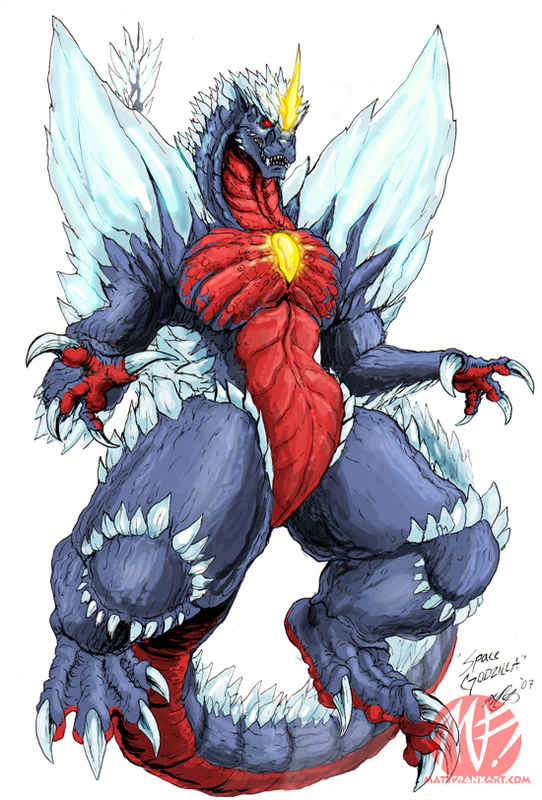 If his shoulder crystals are destroyed, SpaceGodzilla's power becomes drastically weakened. SpaceGodzilla's skin is somewhat resistant to Godzilla's atomic breath, but is pitifully weak to M.O.G.U.E.R.A. 's nose drill. He does have trouble walking so he mostly levitates in his Kaiju form. He has a 2nd brain that if destroyed will leave his legs useless. And his gills are incredibly sensitive as if hit will cause immense pain and will weaken him with multiple blows. But the speed and walking issue is mostly irrelevant when he is in human form. Same with the gills and second brain. They kind of disappear. SpaceGodzilla can fire a Corona Beam from his mouth that he can control as it moves through the air.SpaceGodzilla has super regenerative powers.SpaceGodzilla has telekinesis which he can use to move and levitate objects.SpaceGodzilla can fly by means of encasing himself in crystals. On Earth, he is also shown being able to levitate himself and fly around in an upright posture.SpaceGodzilla increases in power by being near gigantic crystals that he creates.SpaceGodzilla can conduct energy through touch.SpaceGodzilla is able to implant cosmic power in structures that can transmit a signal and have them act as an energy source.SpaceGodzilla can encase his body in a shield to deflect projectiles.SpaceGodzilla is able to unleash bolts of energy from his shoulder crystals.SpaceGodzilla emits an aura that causes electrical disturbances. Attacks: Not in Kaiju form but in his human form he grabs arrows and starts throwing em like javelins and stabbing like they're knives. Combat style: In Kaiju form he just quickly annilizes his enemy but in Human form he takes his time before fighting. He uses judo and boxing. Personality: He has a kind of resentment to Gojira, for reasons that are unknown. He is always slightly ticked off. But he will not attack for no reason. All he will do is insult you and tick you off until you attack. Thats when he will fight back. He is kind to those who he has known for a long time. Unless they are his enemy. He cannot control himself so others need to control him.But he will not let himself be controlled fully. He is the most intelligent body builder you will ever find. He is also rocket scientist smart. Likes: Fighting, Energy, studying, and power. Dislikes: Gojira and the rest of his allies but not with hate just slightly dislikes, Something that is in his way, Him having weakness, and Inability. Fears: Loss of his powers forever and losing to Gojira. Parents: Biollante and Godzilla are his cell donors. Brothers/sisters: Biollante and Godzilla are his half-siblings. History: SpaceGodzilla was first seen flying through space, where he destroyed a manned NASA satellite. He battled M.O.G.U.E.R.A. while he was on his way to Earth, and defeated the mecha. He then landed on Birth Island and attacked Little Godzilla, but Godzilla arrived to save him. After the battle, SpaceGodzilla used his telekinetic powers to trap Little Godzilla. He flew away and flew over Japan, eventually landing and setting up his fortress in Fukuoka. M.O.G.U.E.R.A. arrived in Fukuoka to battle SpaceGodzilla again, but was no match for the monster. Godzilla soon arrived as well and joined forces with M.O.G.U.E.R.A. M.O.G.U.E.R.A split into Land Moguera and Star Falcon. Land Moguera drilled underground and knocked out SpaceGodzilla's power source, the Fukuoka Tower, while the Star Falcon attacked him from the air. Godzilla then had the upper hand, and M.O.G.U.E.R.A. 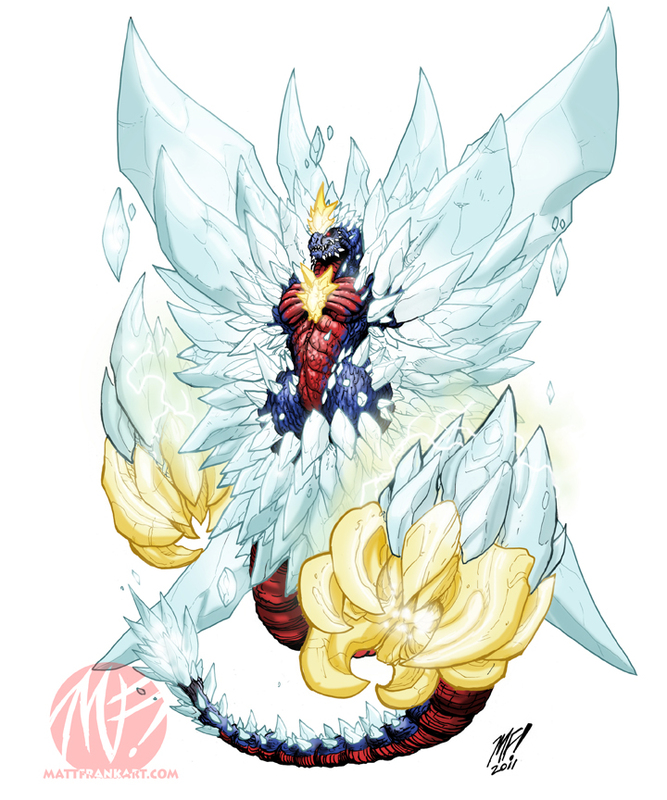 used its spiral grenades to destroy SpaceGodzilla's shoulder crystals. In retaliation, SpaceGodzilla blasted off one of M.O.G.U.E.R.A. 's arms, and proceeded to impale the mecha on his tail and throw it into a nearby building. The weakened SpaceGodzilla was about to explode, but Godzilla blasted him with his red spiral ray multiple times. SpaceGodzilla let out a weak roar and finally exploded into spores of light that floated back up into space.